Oh boy am I happy to be back in the UK and with all my fave beauty skincare products! Today I am going to have a little chat about my top 3 holy grail products. To give you guys a bit of background, my skin is awful! I don't mean spots, Roaccutane thankfully fixed that but the scarring I am left with is ugly, I have an old face which is a little sad but without having a skin peel or something similar there isn't a great deal I can do about it. 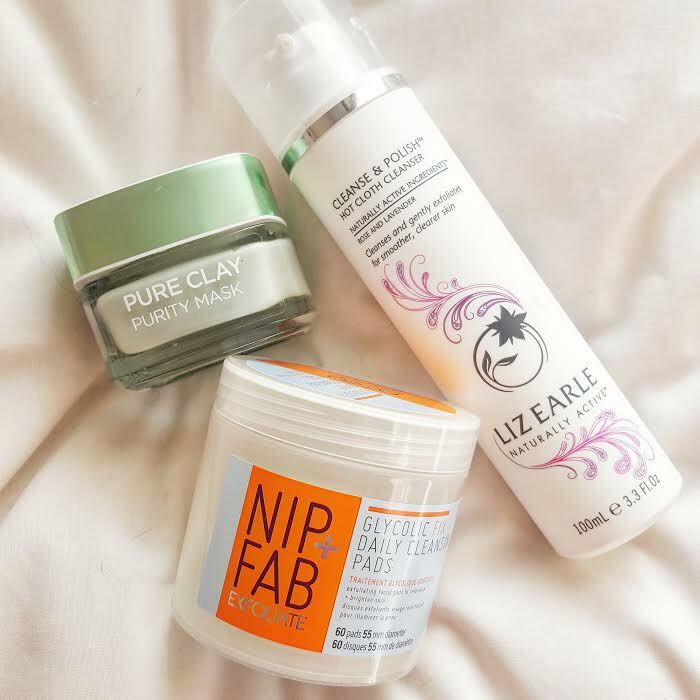 My skin is still a little temperamental so I really try not to do too much too it but I have got into a really great skincare routine which is working really well at the moment. Let's start with my fave cleanser which is the Liz Earle Cleanse & Polish , I just find that this product is so gentle on my face and immediately my skin looks fresh and and more mattifed (is that even a real word?) The only thing that annoyed me a little is the scents of these products, I'm not a fan of the original one and I don't even love the Rose and Lavender that much which is a shame but it does a really nice job so I am happy to over look it. Secondly we have a new little fave, which is a bit of a surprise to me because I wasn't expect to love this face mask as much as I do. I recently wrote about my first impressions on the L'Oreal Pure Clay Purity Mask , in the post I actually have a little moan because I wanted the detox mask but I can say after a few weeks of using it I'm actually really surprised how it has improved my skin. I really didn't think it would do much but it definitely has reduced some of the blemishes I had or at least helped them look less harsh. Super impressed with that little face mask. Finally we have my most BELOVED product which are the Nip + Fab Glycolic Fix Facial Pads though as you can see I have been using them for quite some time but when I moved out to Florence you just couldn't get them so I stopped using and oh my god, I had completely forgotten how good they were. I bought these in Superdrug as they were on a Buy One Get One Free which is bloody great because they are on the slightly higher end of the high street but they are SO worth it! They really help to reduce scars, pore and evens out my skin, seriously if you have a few acne scars or would like to make the appearance of your skin a bit smoother you need to check these out! There we have my top 3 holy grail skincare products! What are yours? I do use the Nip and Fab pads, but wasn't too impressed. Maybe because I have been using acids for a long time they did not make much of a difference. If you don't have other ahas in your routine though I can see them being life changing. I've heard quite a bit about the Loreal mask. That's another one I need to try! Never tryed these products but sounds to be awesome for you.